To the readers here for the PNW Nature Blog Scavenger Hunt - welcome, and thank you for stopping by A Day Without Rain! This blog is devoted to celebrating our unique Pacific Northwest nature and encouraging everyone to explore, enjoy and protect this stunningly beautiful place we call home. Good luck with the scavenger hunt, and happy reading! We've all been there. While hitting the trails for a weekend nature excursion, your hiking buddy thoughtfully squints at a tree along the trail, nudges you with an elbow, points and asks "What kind of tree is that?" Your face flushes; you feel like this is something you should know. After silently running through every kind of tree you can remember from last year's visit to the Christmas tree lot, you lamely answer "Ummm, an evergreen..."
Here in the Pacific Northwest, we like nature. We like being outdoors. We like the green and the moss and the damp earthiness. But sometimes, we're unfamiliar with the details, such as those that allow us to identify that mystery tree on the trail. 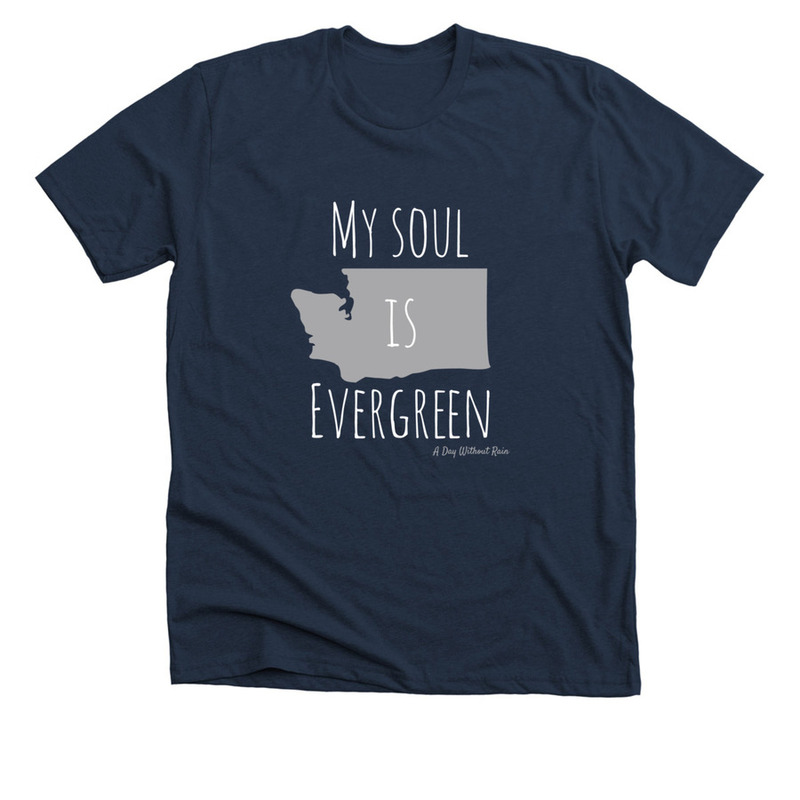 That was certainly the case for me, up until a few years ago when I had a desire to connect further with what I was seeing when I was out in nature, and decided to learn the names of the plants and trees commonly encountered in our Pacific Northwest forests. Thereafter, my hiking experiences were forever changed. Nature was no longer experienced peripherally, as something to just pass through. It became something to discover, appreciate, and understand. Robust and sturdy, these are the iconic evergreen trees of the Pacific Northwest, and are my personal favorites. In the few remaining patches of old-growth forest in our region, you can find monster Dougs towering 250 feet tall, and so large in circumference that it would require at least half a dozen people stretching their arms around to completely encircle it. Most Doug firs you'll encounter along the typical hiking trail are smaller: a few feet in diameter at most. Identifying features: These trees are distinguishable by their rough, gnarled bark gouged with deep crevices and their sturdy, springy branches covered in long, thin needles and bearing large pinecones. The larger, older Dougs will have mostly naked trunks, with only a crown of branches on the upper part of the tree. I will admit, these trees are not my favorite, as they lack the formidable size and robust appearance of the impressive Doug firs. Actually, I find that they tend to look half-dead most of the time, due to their sparse branches and needles. Nevertheless, Western hemlock is one of the characteristic PNW conifers, and is actually the official Washington State Tree. Identifying features: The bark is relatively thin and flat, with shallow vertical crevices. The branches bear short, flat needles with rounded tips, and the pinecones are very small. These trees also have an overall weepy, almost frail appearance, and their tasseled treetops always droop to the side. Bonus tip: Western hemlock really love to take root in the decaying stumps of fallen cedar trees. When you're hiking, keep an eye out for these alien-looking trees with tentacle-like roots. 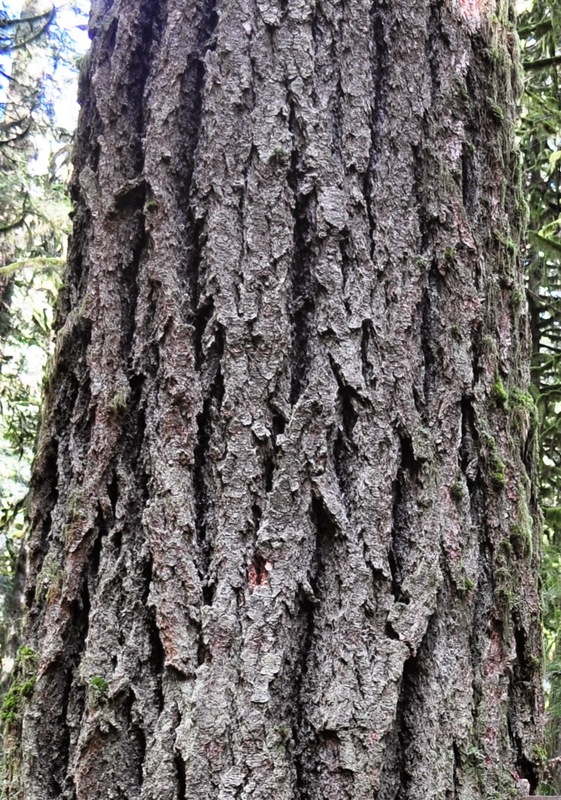 This tree is ubiquitous in Pacific Northwest forests, and has a unique appearance that makes it easy to identify. Like the Douglas fir, specimens of massive proportions can be found in the few old-growth forest fragments that remain in the region, but the cedar trees you encounter along the trail will most likely be no more than two to four feet in diameter. Identifying features: The bark of a Western red cedar looks like it was run through a paper shredder and stuck haphazardly to the trunk in long vertical strips, and the edges are often peeling up. Underneath, the tree's flesh is a deep red-orange color. From a distance, the branches have a lacy appearance, and almost look as though they've been draped with thousands of dark green doilies. Yes, I know that sounds weird but take a look for yourself - you'll see what I mean! An up-close look at the branches reveals flat green needles joined together in a fan or feather-like appearance. Bonus tip: It may be hard to believe, but if you're hiking in a forest in the Pacific Northwest, it was most likely logged sometime in the past century. The forest through which you're now hiking is a second-growth forest that regrew after the original old growth was clear-cut. Evidence of past logging activity is still writ in the landscape, and can easily be found if you know where to look. Have you ever seen a stump with a notch in it, like the one pictured below? This is a cedar stump, still present a century later (thanks to the tannins in cedar wood that allow it to resist decay), bearing a notch where a springboard was inserted, which the logger would have stood upon as he sawed the tree down. These stumps are scattered throughout second growth forests, and are a reminder of the magnificent trees that once covered the Pacific Northwest. 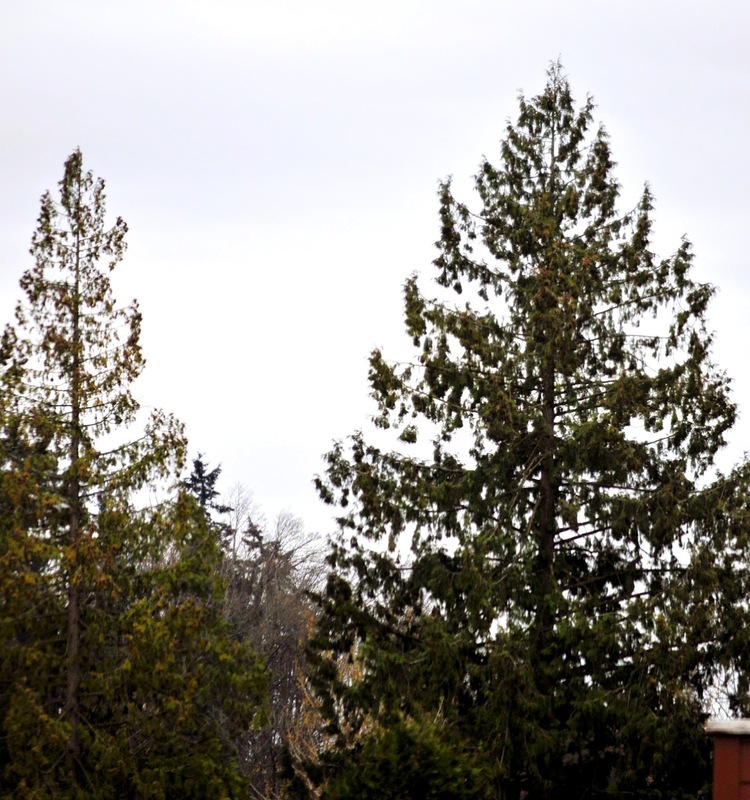 This is not an exhaustive list of Pacific Northwest conifers, but these three are by far the most common species. When you get back on the trail, visit a nearby park, or step into your backyard, see how many conifers you can identify. Are there any notched stumps or alien hemlocks? See what you can find... you may be surprised at how much more engaging your nature experiences become! To see some of the massive old-growth trees mentioned earlier, plan a trip to Rockport State Park or South Whidbey Island State Park - both are wonderful parks and boast some of the largest old-growth trees I've ever seen. Saint Edward State Park is also a favorite of mine; there are no old-growth trees here, but there is a breathtakingly gorgeous second-growth forest and plenty of notched cedar stumps and alien-looking hemlocks to discover. Name that tree! I found this monster at South Whidbey Island State Park. Thank you for reading! 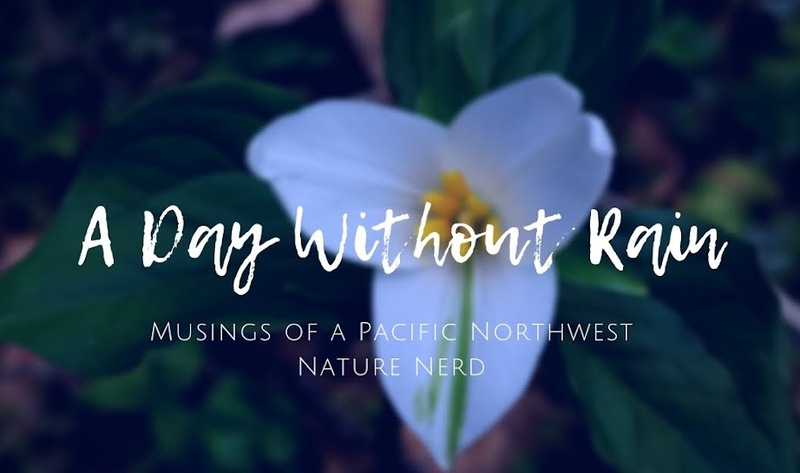 Stay connected to A Day Without Rain for more PNW nature writing, as well as relaxation and inspiration every week on Nature Nerd Wednesdays. Simply enter your e-mail address in the right-hand sidebar to automatically receive e-mails with new blog posts! Oooo! One of my favorite topics AND you love state parks!! 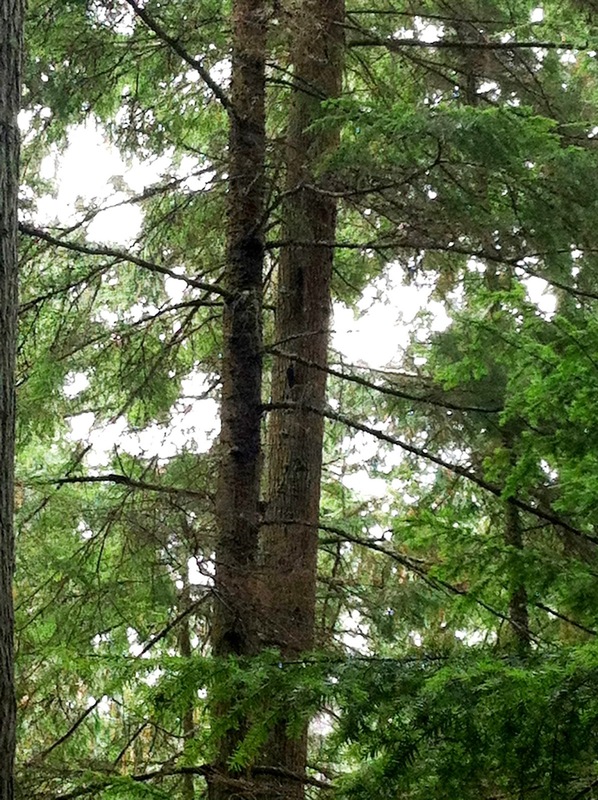 We just went to South Whidbey Island State Park last weekend and LOVED the old-growth there. Great post! Thanks so much for reading! South Whidbey State Park is amazing... great place to see those old-growth trees that are so rare in our state now! This article is very helpful. I'm constantly asking my husband to identify the various trees in our neighborhood and in our backyard; now I can do so on my own thanks to your information. Thanks for reading, Irene! I'm glad you found the information helpful. These trees are easy to identify once you learn to recognize their subtle differences. I'm planning to write another post in the near future on how to identify different species of deciduous (leafy) trees... stay tuned! Thanks for reading, David! These trees are pretty special to our PNW forests... and to those of us who spend a good deal of time in said forests! So happy to have found your blog! Likewise! I've added your blog to my reading list and look forward to following your posts. Thanks for reading! Great post!! My totem tree are western red cedars. At long last, I've been able to write this follow-up to my Conifer Confusion article, which ended up being the most-read post on my blog to date! Thanks to all for reading, and if you haven't checked it out yet, click the link above and learn how to identify three of the most common coniferous (evergreen) trees found in the Pacific Northwest lowland forests. Now we'll turn our attention to a few of the most common deciduous trees native to Pacific Northwest forests. The reason I had to wait so long to put this post together is because deciduous trees lose their leaves in the fall, and I had to wait until they were fully leafed out again this spring before I could run out and snap some photos to help with identification. Looking at photos of leafless trees just wouldn't have been as exciting. Hello dear readers! Or reader. Or perhaps I'm talking to myself here. I've been away from the blog for awhile, but am back to share a recent adventure. Last weekend, I had the opportunity to hike the Bagley Lakes trail with my book club friends. For this month's outing, we read Maria Mudd Ruth's A Sideways Look at Clouds, and the author herself joined us on the trails! I've been absent a lot lately - from the blog, the book club, and many other things that used to be so important in my life. However, it is long past time to reconnect, so that's how I found myself standing at the trailhead on Sunday morning in forty-two degree weather with rain coming down sideways. My nose was numb and cheeks red and stinging within minutes as the cold wind buffeted my Gore-Tex clad body. I was gloriously excited.